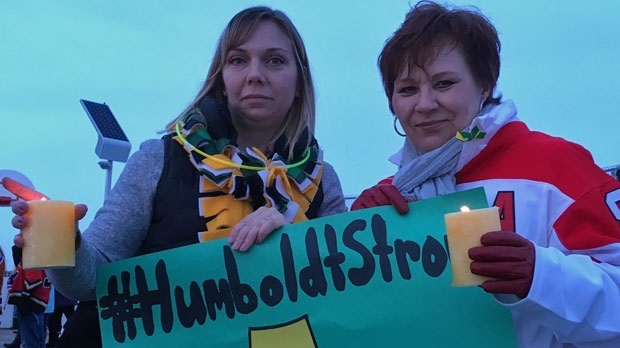 More than 1,000 people, including several Calgary Flames, gathered at the outdoor rink at Chinook Winds Park in Airdrie on Friday to show their support for severely injured local product Ryan Straschnitzki and the other players and staff of the Humboldt Broncos involved in a deadly crash. 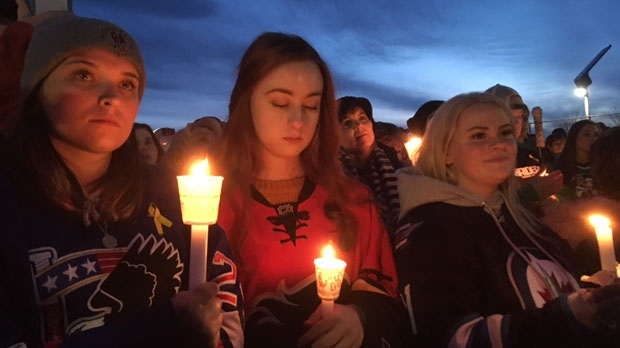 Participants in the vigil donned hockey jerseys, lit candles and carried hockey sticks and signs of support during the vigil honouring the memory of the 16 people lost to, and supporting the survivors of, the April 6 crash at a highway intersection south of the town of Nipawin, Saskatchewan..
Straschnitzki, the 18-year-old defenceman who heralds from Airdrie, was paralyzed in the devastating crash and remains in hospital in Saskatoon with his parents at his side. 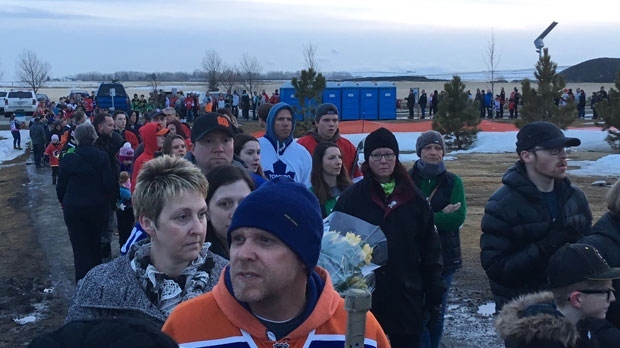 Among those in attendance at the vigil were Sean Monahan, Travis Hamonic and T.J. Brodie of the Calgary Flames and all three were wearing personalized Flames jerseys with ‘Straz Strong’ nameplates and the number 10, a nod to the number Straschnitzki wore with the Humboldt Broncos. The Straz Strong fundraiser to support the Straschnitzki family was created by some of his friends and they are selling hats with the slogan. All proceeds from the sale of the hats will help the Straschnitzkis purchase a standup wheelchair or experimental treatments should Ryan elect to pursue those paths.